The research in Pan-Asian Gas Pipeline is compiled from sources believed to be reliable. However, its accuracy is not and cannot be assured. Grenatec does not indemnify any party relying on the content of the report against any action, suit, claim, demand, loss, cost or expense whatsoever arising out of or referable to this document. By downloading this report the recipient and any subsequent entities receiving this study from the above readers release Grenatec from liability of any kind arising from or referable to this report. Website links in this report are for information purposes only. Their inclusion does not constitute endorsement by Grenatec regarding the accuracy of the information in the link nor the organization that created the content. A Pan-Asian Gas Pipeline is a big idea. As ‘Asia’ (i.e. China, Japan, South Korea, the Association of Southeast Asian Nation states, East Timor, Papua-New Guinea and Australia) emerges as the world’s largest economic bloc, it needs trillions of dollars of new infrastructure. The majority of this infrastructure is energy related. Much of that will be aimed at delivering natural gas during the multi-decade transition to a clean energy economy. Given this, the most sensible long-term path is to design and build a regional natural gas infrastructure that can be repurposed to carrying clean energy. A Pan-Asian Gas Pipeline achieves this. Investments in deepening and broadening regional natural gas pipeline interconnections in Asia can lay the foundations for an integrated energy network of natural gas, electricity and data — or a Pan-Asian Energy Infrastructure. This network would be the largest in the world. It would serve two billion people — – one third of humanity — who currently produce one-fifth of global GDP. Markets don’t come much bigger than this one. A Pan-Asian Gas Pipeline can be achieved by combining fiscal policy (ie carbon pricing and eliminating perverse fossil fuel subsidies) coordinated infrastructure investment (through multilateral cooperation) and marketplace reforms (through more open markets). The result would be lower prices (through heightened competition) and increased supply security (through expanded supply). 1. ‘Asia’ (ie China, Japan, South Korea, the ASEAN states, Australia) needs trillions of dollars of new energy, transport and telecommunications infrastructure between now and 2050. 2. As it becomes the world’s largest regional economy, Asia holds the key to minimizing destructive global climate change. 1. Asia already has interconnection-friendly large-scale gas infrastructure projects planned or underway. 1. Asia should enhance interconnection between the infrastructure projects mentioned above and new ones yet to be built. 2. Asia should ‘bundle’ new power line, natural gas and fiber optic infrastructures to create more flexible cross-border energy and information networks. 3. Reduced geopolitical tension over energy resources. An Asia-spanning natural gas pipeline stretching from Australia to Northeast Asia will prove cheaper, more efficient and more ‘future proof’ than the Liquid Natural Gas (LNG) infrastructure now being built and planned for the region. It could also establish the critical foundation for a multi-faceted, multi-century Pan-Asian Energy Infrastructure. Natural gas pipelines can be adapted to carry future fuels. These include hydrogen, biofuels and even waste carbon. They will become important parts of tomorrow’s energy system. These are things LNG can’t do. LNG, by contrast, is a narrow, single-purpose, single-generation technology. That makes LNG a poor economic value for the long term as a solution for providing for Asia’s energy needs. A regionally-networked pipeline merits serious consideration. Otherwise, Asia could head down an economically expensive, environmentally-damaging ‘wrong-way’ street of inefficient infrastructure. This study makes a ‘first effort’ at quantifying the relative long-term value of an Asia-spanning, open-access natural gas pipeline network compared to an isolated series of bilateral, bespoke LNG projects. This study finds that gas pipelines are a better long-term investment than LNG. This report concludes, pipelines are a better long-term option than LNG for the regional transport of natural gas followed by the transport of future fuels. This report also concludes natural gas pipelines can open the door to a broader, bundled Pan-Asian Energy Infrastructure. A long-term Pan-Asian Energy Infrastructure would ‘bundle’ natural gas pipelines, fiber optic cables and High Voltage Direct Current power lines. These would provide the underpinning for a comprehensively-networked energy economy in Asia. This would benefit everyone. Steps are already being taken in this direction. Existing Asian infrastructure projects like China’s Fiber Optic City, Australia’s National Broadband Network, ASEAN’s Trans-ASEAN Gas Pipeline and Trans-ASEAN Electricity Grid projects are well suited for eventual interconnection. In our research, Grenatec defines ‘Asia’ as China, Japan, South Korea, the Association of Southeast Asian Nation states, East Timor, Papua-New Guinea and Australia. Two billion people (one-third of humanity) live in this region. One-third of global greenhouse gas emissions are emitted here. Most of the world economy’s economic growth in the next few decades will come from here. In coming years, Asia needs trillions of dollars of new infrastructure. This includes roads, airports and ports and telecommunications capacity. The biggest need is for energy infrastructure. Influential voices contend Australia could benefit from building infrastructure connecting itself to Asia to export its natural bounty of energy resources. These voices include the International Energy Agency, Japan’s Tokyo Institute of Technology, Australian gas major Santos, one-time Australian Climate Commissioner Tim Flannery and Australia’s national research organization the CSIRO. The visions to date have mostly involved the potential for Australian exports of solar energy, but also solar-derived future fuels and natural gas. Natural gas is Australia’s most exciting near-term energy export. Over time, it can lead the way for later exports of cleaner energy resources (like sun) if sensible policies based upon long-term visions are implemented. Roughly US$175 billion of LNG energy projects are under construction or proposed for Australia. For that amount, a natural gas pipeline of equivalent capacity could have been built between Queensland and Northeast Asia. Given this, the time is right to consider more inclusive, far-reaching, far-sighted ideas. This is particularly so since new LNG projects in Australia face increasing ‘social license’ risk. This worsens price and investment uncertainty. For instance, Woodside’s proposed James Price Point LNG project in Western Australia was cancelled due to civil society resistance from residents of the nearest township: holiday-oriented Broome. Separately, new LNG projects in Gladstone, Queensland have aroused concern at the United Nations Educational, Scientific and Cultural Organization (UNESCO). UNESCO warns Australia could lose World Heritage Status for the Great Barrier Reef if its negligent stewardship of the reef isn’t improved. A ‘tabula rasa’ re-evaluation is warranted. Grenatec’s goal is to stimulate new thinking, new research and new ideas. Grenatec concludes a Pan-Asian Gas Pipeline is a better long-term deal for Asia than a series of single-generation LNG projects. Grenatec further proposes a specific pipeline topology for the region. The first is to deliver natural gas to Northeast Asia primarily by land. This route would traverse Southeast Asia, the Mekong States and China en route to Japan, and South Korea. The second is to deliver natural gas to Northeast Asia through a largely sea-based pipeline traversing the South China Sea, providing a route to market for new gas supplies developed there. By evaluating comparative costs of other natural gas pipeline projects in the world, Grenatec has derived an alternative costing of a Pan-Asian Gas Pipeline. At present, roughly $175 billion of LNG capacity has either been built or is under construction in Australia. This capacity can carry roughly 61.5 billion cubic meters of natural gas from Australia to northern Asia. Another $173 billion is planned. If all built, that new capacity could carry the equivalent of 66.7 billion additional cubic meters of gas from Australia to northern Asia. 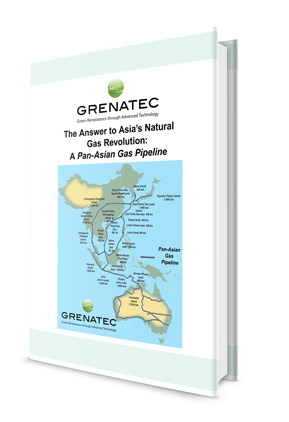 Based upon an analysis of existing and planned natural gas pipeline projects elsewhere in the world, Grenatec estimates a Pan-Asian Gas Pipeline capable of carrying 66.7 billion cubic meters of natural gas per year between Australia and Northeast Asia would cost between $186-220 billion. The low end estimate is based upon a land-based system. The higher end estimates are based upon a sea-based system, which could traverse the South China Sea in one of two ways. Therefore, for a roughly-estimated price premium of 10-30% — a flexible, robust, future-proof and more environmentally-friendly regional distribution system could be built. These findings call out for deeper research and a broader-minded analysis of future regional energy infrastructure choices than bilateral, bespoke LNG projects. In addition to longevity and environmental friendliness, a pipeline system offers the additional advantage of providing access to new gas fields in the region without having to build entirely new, single project infrastructure. This can spur investment in new and marginal fields that may not be able to pass investment hurdle rates as standalone projects. Naturally, a regional natural gas pipeline heightens sovereign risks along the transit route. But mitigating such risks could spur deeper regional energy market cooperation, particularly in the South China Sea. This would reduce sovereign risk. Indeed, it can be argued that unsettled borders and gunboat diplomacy presents a greater sovereign risk than the collective complexities of deeper energy market integration. Given that energy exploitation lies at the root of geopolitical tension in both the South China Sea and East China Sea — a Pan-Asian Gas Pipeline offers political and economic opportunities as well as risks. For simplicity’s sake, Grenatec’s Pan-Asian Gas Pipeline costings do not address bundling natural gas pipelines with HVDC power lines and fiber optic cables. Grenatec believes such bundling would significantly reduce investment costs. That potential is analysed in Grenatec’s larger study entitled Pan-Asian Energy Infrastructure. Australia is the linchpin for a Pan-Asian Gas Pipeline. With LNG projects on the drawing boards amounting to more than 10% of domestic GDP, Australia is now making decisions that will shape its destiny — and that of Asia — for decades to come. Sadly, this new wave of Australian energy investment is hitting snags. Labor shortages, skill shortages, a strong Australian dollar and an unreformed domestic energy economy are reducing investor confidence. It increasingly looks like a bad economic decision, given that all this problems look to be long-lasting features of the Australian economy, if not permanent. Energy executives have been rasing these issues for years now. All of this points to interlinking problems between infrastructure, market structure, pricing and supply security. Australian Energy Minister Martin Ferguson has said he believes eight LNG plants will be enough for Australia. A rethink focused on a more integrated domestic energy (natural gas and electricity) and data network as well as integrated export routes could overcome these hurdles. Australia has three major gas producing export regions – with a fourth and fifth likely on their way. The first is the Carnarvon Basin, centered around Karratha, Western Australia. The second is the Bonaparte Basin in Western Australia and the Timor Sea off the Northern Territory. The third is in interior Queensland, centered upon Gladstone. The fourth and fifth are the Canning Basin in Western Australia and the Cooper Basin, predominately in South Australia. LNG complexes exist in Karratha and Darwin. These ship LNG to North Asia. In Queensland, three LNG plants are under construction in Gladstone. Others are planned. LNG plants also are proposed for Newcastle in New South Wales and Whyalla, South Australia. The aim of these LNG developments is to export large new supplies of conventional and unconventional gas from Australia. These gas supplies exist in the ocean areas to Australia’s north, the Canning Basin in the Kimberley region and the Cooper Basin in eastern Queensland and northeast South Australia. The Carnarvon Basin is Australia’s most developed LNG region. There, offshore gas resources are pumped to land-based LNG facilities feeding tankers headed to Asia. The Northwest Shelf and Timor Sea is Australia’s major new offshore natural gas exploration and production frontier alongside the Timor Sea. The key field in this region is the Browse Basin. These three fields sum up the entire controversy over natural gas. All three are templates for the future. Woodside burned its fingers on Browse with a land-based LNG plant at James Price Point. It’s now studying FLNG, something Shell is moving ahead with on its Prelude Field. Meanwhile, Inpex is moving ahead with Ichthys through a pipeline. Investment plans have been developed — but not yet finalised — for the Browse and Ichthys fields in the Browse Basin and the Sunrise and Abadi fields in the Timor Sea. Development of these fields will open the way for other, smaller fields to be developed. This will create a catalytic, long-term cycle of investment. Proposed natural gas developments in the Northwest Shelf and Timor Sea now amount to roughly 67 billion cubic meters of potential new natural gas export supply. In Queensland, development of coal seam gas resources in the state’s interior has led to ground-breaking on three LNG complexes (Australia Pacific LNG, Gladstone LNG and Queensland Curtis LNG) at the port of Gladstone. Together, they comprise a significant amount of natural gas shipment capacity. Proposed additional capacity slated for Gladstone would add to this number. Estimates by Grenatec indicate these plants have cost more than a land-based based pipeline between Australia and China, Japan and South Korea. Taken together, the 49.7 billion cubic meters of potential new supply in the Northwest Shelf coupled with the 17 billion cubic meters of potential new supply in Queensland, create a total of 66.7 billion cubic meters. That’s enough to build a large-scale pipeline to Asia to harness economies of scale. The time to analyze this is now. Given that LNG projects permanently alter the landscape and the economies of host communities, it’s worth posing the question: is LNG the right choice? For the tightly-clustered Browse Basin, Bonaparte Field and Timor Sea, this report concludes natural gas pipelines to Asia offer greater long-term utility and greater long term benefits than LNG. This is particularly so given the location of the resources — which lie in a neat line stretching from the Northwest Shelf and Queensland through the Timor Sea to Indonesia. As such, it pays to further examine this alternative line of thinking. Woodside’s Browse Basin project is the linchpin that may determine the future of natural gas development in Australia. All of the issues facing the Australian natural gas industry crystallise in this one proposed project. To develop Browse and export its gas to Asia, Woodside originally proposed piping the gas to a coastal LNG plant at James Price Point, an empty bit of coastline 60 kilometers north of Broome. But the James Price Point location generated divisive local controversy in Broome its social and environmental impacts upon a holiday region wholly reliant upon tourism. But in response to growing controversy over James Price Point, Woodside withdrew. It’s now studying alternatives such as piping the gas 1,000 kilometers south to existing Woodside LNG facilities in Karratha or processing it in a floating LNG facility anchored at sea. Adjacent to Browse is the Ichthys field, slated for development by Japan’s Inpex. Inpex plans to develop Ichthys by piping its natural gas 900 kilometers to Darwin to feed an LNG plant there. Given that 1,900 kilometers of subsea gas pipelines have already been proposed as workable by Woodside and Inpex, this begs the question: if subsea pipelines are workable for those distances — why not go the whole way? This is where the Timor Sea comes in, where Woodside is also a major player. Sunrise is the big field in the Timor Sea. Sunrise also is slated for development by Woodside. Development of Sunrise is being held up due to disagreements between the field’s two owners — Woodside and East Timor — over how to develop it. Woodside originally proposed pumping Sunrise’s gas to Darwin to an LNG export complex in Australia’s Top End. Woodside now believes floating LNG is the best option. But East Timor wants Sunrise’s gas pumped to an LNG complex on East Timor’s south coast. East Timor has even gone so far as to indicate it will veto development of Sunrise if an LNG plant isn’t built in East Timor. Neither side is giving ground. The standoff is holding up not just development of Sunrise, but other fields in the Timor Sea as well. The biggest of these is Inpex’s nearby Abadi Field. At present, East Timor is being assisted in researching the feasibility of a pipeline between Sunrise and East Timor by Malaysia’s Petro-Mekong Corp Sdn Bhd. This complicated game of chess involves a limited number of players: Woodside, Inpex and East Timor. Roughly $140 billion of investment hangs in the balance. No one gains from uncertainty. But if Inpex is committed to building a 1,000-kilometer subsea pipeline from Ichthys to Darwin, and Woodside will consider a 1,000-kilometer subsea pipeline from Browse to Karratha and East Timor insists Sunrise’s development must exporting LNG from its territory — an optimization outline emerges. Browse and Ichthys gas could be pumped through a subsea pipeline to the Sunrise Field for transport to East Timor and onward to northeast Asia over a pipeline traversing the region. This could be done by creating a ‘central junction’ at either the Bayu Undan or Sunrise Field. Sunrise, in turn, could be used an aggregation point for onward pipeline shipment of natural gas to East Timor, Indonesia, the South China Sea and, eventually, China, Japan and South Korea. This multi-company, multilateral approach would raise the confidence of developers of other Timor Sea gas fields, such as those seeking to the Abadi Field (Inpex again), the Barossa Field, (Santos) and the Evans Shoal Field (ENI). Elements of such a plan already have been lofted by the likes of ConocoPhilips, which has interests in the Browse Basin and has suggested building a parallel pipeline to Inpex’s between the Browse Field and Darwin, or to aggregation at the Bayu Undan field. That’s because these secondary fields could be developed with greater certainty of access to transport infrastructure instead of building bespoke delivery infrastructure themselves. But this, of course, pre-supposes a collective infrastructure can be operated on a ‘common-carrier’ basis, like Australia’s National Broadband Network and, potentially, like the future Hamersley and Robe iron ore railways in Australia’s Pilbara region. Open-access pipelines would create cost-lowering economies of scale and distribute those benefits to all. They would provide a pathway to market over time for developers of a host of secondary gas fields – most now slated for development through floating LNG. Therefore, reorienting Browse, Ichthys and Sunrise toward a pipeline infrastructure would serve everyone’s interests. In addition to breaking the impasses over Browse and Sunrise, it would create positive knock-on effects through encouraging investment in secondary Timor Sea fields like Tern and Evans Shoal and secondary Browse Basin fields like Poseiden. Building out important infrastructure with a longer-term view enhances the economic wealth natural gas projects will bring Australia. Over time, as fields like Browse wind down, newer fields can use the vacated subsea pipeline capacity to reach downstream markets. Everyone gains. Under the current development paradigm, bespoke infrastructure serving single projects leaves behind unrepurposable infrastructure in just a few decades. This results in industrial blight after a single amortization period. Longer-term vision is needed. Building a pipeline from Browse and Ichthys to Sunrise and onward East Timor and Asia makes development of James Price Point unnecessary. It would gain the support of East Timor and lay the foundation for development of the numerous other fields in the Bonaparte Basin and Timor Seas. The trans-Timor Sea pipeline idea has pedigree. Santos suggested it in 2005 as part of a plan to deepen and extend Australia’s domestic pipeline system. The Timor Trench is a tectonically-active section of water roughly 50 kilometers wide. It lies at the north end of the Timor Sea. Any pipeline laid between Australia and Asia must cross this trench — or another like it. The good news is that subsea pipelines either have been built or are planned for other deep water areas around the world of equal seismicity. Woodside has interests in two deep water Gulf of Mexico oil and gas projects: Power Play and Neptune. Therefore, Woodside has access to technology suitable for application to the Timor Sea. In Asia, Woodside has explored for gas in offshore South Korea. This indicates both an interest by Woodside in deep water projects and expertise in deep water operating environments. The tectonic risk of the Timor Sea is between 5-6 on the Richter scale. That’s roughly the same as the North Sea and Black Sea. Both of these have natural gas pipelines traversing them. It’s also about the same as the tectonic risk on Bangka Island, just south of Singapore. There, Indonesia plans to build two nuclear plants. In 2002, the land-based Alyeska Pipeline on Alaska’s North Slope survived a 7.9 Richter Scale earthquake. That tremor shifted the ground beneath the pipeline it 5.5 meters horizontally and 60 centimeters vertically. It was one of the largest earthquakes to hit North America in a century. Due to the pipeline’s earthquake-resistance design, no oil was spilled and the pipeline required only minor repairs. Furthermore, the oceanic salvage industry also is well-established in Asia. The expertise for repairing subsea pipelines is largely the same as that needed for subsea power lines and fiber optic cables. Following the March 11, 2011 Fukushima earthquake (which measured 6.2 on the Richter scale), salvage ships dispatched from Shanghai repaired Japan’s severed subsea fibre optics links to the world within two months. In a study for East Timor, Perth-based Incitec Engineering found that most earthquakes in the Timor Sea sea occur deep below the sea bottom — reducing the risk to benthic infrastructure. In the onshore Canning Basin located southeast of Broome, Perth-based Buru Energy has found exciting, potentially large and developable supplies of oil and gas. These will need a route to market. Buru has agreed to extending the length of the region’s pipeline system, currently limited to the existing Dampier-Bunbury Natural Gas Pipeline (DBNGP) all the way system up to the Kimberley from the Pilbara, where it currently ends. Extending the Dampier-Bunbury Natural Gas Pipeline would offer benefits of all kinds. Not only would it provide Buru a route to market for its Canning Basin energy discoveries, but it would encourage additional development of oil and gas resources in the region by reducing market delivery risk. The Canning Basin is shaping up as a huge potential onshore energy resource for Australia. Given this, Buru’s proposed Dampier-Bunbury Natural Gas Pipeline extension to Broome could later be reasonably extended all the way to Darwin to provide export markets for Canning Basin gas supplies. Such a pipeline might follow the existing Great Northern Highway, which abuts many Canning Basin oil and gas exploration properties. And if a pipeline were laid along the Great Northern Highway, it could be bundled with other infrastructure such as power lines and fiber optic cables. These would encourage economic development in that isolated portion of the Kimberley. It could also connect to Darwin and to a Trans-Timor Sea pipeline, opening up export markets for Canning Basin gas. The idea underlying all these interconnections is to create multi-purpose networks instead of bespoke one-offs that will be abandoned after just a few short decades. Longer-term thinking is needed. Darwin already hosts the Darwin LNG Plant. Under current thinking, it will soon host the Ichthys plant. If Darwin emerged as an aggregation point for natural gas exports, it could exert greater influence over world markets akin to the influence the Henry Hub price exerts in the United States. This becomes particularly interesting when issues of economies of scale come into play. If a common carrier infrastructure were put in place connecting the Browse field with the Timor Sea, and/or a terrestrial pipeline from the Pilbara-Kimberley to Darwin. Darwin then becomes a hub. What makes this idea compelling is the prospect of linking up Queensland natural gas supplies for export through Darwin as well. This would spare the Great Barrier Reef from the environmental trauma of extensive LNG development in Gladstone. In Queensland, large new coal seam gas supplies are being developed with the aim of shipping them to Asia from LNG facilities in Gladstone. In Gladstone, three LNG projects are under construction. One or more additional ones may also be built. This sends an unambiguous signal that energy development trumps environmental values — at least in Queensland and at least right now. The United Nations Educational, Scientific and Cultural Organization (UNESCO) is among those getting worried. It claims large-scale development of LNG complexes in Gladstone significantly threatens the Great Barrier Reef. UNESCO warns that if uncontrolled industrialization of Queensland’s ports continues, Australia may lose World Heritage Status for the Great Barrier Reef. That’s a big price to pay for an industrial infrastructure that will become obsolete and be abandoned in a few short decades. A pipeline system carrying interior Queensland’s gas to the Northern Territory for on shipment to Asia through Darwin would avoid the Great Barrier Reef altogether, reducing the scope for damaging maritime accidents. Doing so would safeguard the perpetual economic annuity Australia’s Great Barrier Reef’s undersea wildlife presents in the form of a tourism industry. That’s a more sensible long-term option. Reconfiguring Queensland’s natural gas exports to pipelines doesn’t require much blank-sheet thinking. It would largely merely require revisiting and extending already proposed pipeline projects for Queensland and elsewhere in Australia. These include the PNG-Australian gas pipeline, the Darwin-to-Moomba pipeline and the Gove Lateral. This project involves building a pipeline to bring PNG gas supplies down into the Australian gas pipeline network by crossing the Torres Strait. One possibility is to couple the gas pipeline with High-Voltage Direct Current power lines bringing PNG hydro power to Queensland, linking Australia’s and PNG’s electricity grids. The PNG-Australia pipeline has been supplanted by a plan involving Papua-New Guinea’s local oil and gas producer Oil Search and Exxon-Mobil proposing to build a US $15 billion LNG gas export venture in Port Moresby. As currently configured, natural gas extracted from PNG’s Highlands would be piped to Port Moresby LNG facilities for shipment to North Asia. However, were the gas across the Torres Strait to Queensland, it could enter an Australian pipeline network taking it to Darwin for onward passage to Asian markets. This could occur by either pumping the gas down to Townsville and across to Mt. Isa en route to Darwin, or through an extension of the previously proposed Gove Lateral. This would have connected Weipa at Queensland’s northern tip with the mining town of Gove in Arnhem Land. In 2001, Epic Energy proposed a Darwin-to-Moomba pipeline to enable gas from the Timor Sea’s Bayu Undan field to be piped to Moomba for onward transit to Australia’s Eastern cities. This idea was later also proposed by Santos. In late 2012, Santos opened Australia’s first shale gas well, pumping the output into existing pipelines serving Adelaide and Sydney. More such wells are sure to be drilled in coming years. Beach Energy is exploring for natural gas in South Australia’s Cooper Basin. If Beach finds enough to make exports worthwhile, Beach has chosen Whyalla’s Port Bonython as its preferred location for an LNG export facility feeding tankers headed to Asia. A Port Bonython location would mean extra sailing time for LNG tankers. It would also expose them to the Southern Ocean’s rough weather. A better alternative would be to pipe the gas to Darwin through a route such as that already-proposed by both Epic and Santos. Doing so would open up the interior to development of shale gas and other unconventional gas reserves in the Outback, now being pioneered by such companies as Buru Energy in the Canning Basin. A more comprehensive Australian gas pipeline system based upon extending already-developed designs offers a compelling alternative to LNG-based exports. This is particularly so given Australian gas company Santos’ call to more deeply integrate Australia’s domestic pipeline system with that of Papua-New Guinea and East Timor as well as calls by Epic Energy to connect Darwin to Moomba and Buru Energy’s call to build a pipeline to Broome. All these ideas can and should be revisited as the coal seam and shale gas revolutions gear up. They may offer a more environmentally benign means of developing Australia’s natural gas resources than LNG. And that, in turn, would reduce the ‘social license’ risk of their development. Another way of reducing the ‘social license’ risk of unconventional gas development in Australia and assuage the worries of farmers and environments is to allow risk-assessment experts to handicap the hazard and place a future financial value on it the industry would pay as a condition of access. In other words, the unconventional gas exploitation industry would be required to carry multigenerational insurance coverage on each hydraulic fracturing well it drills — and to insure it privately. In this way, the private insurance industry can provide its expertise in handicapping the risks of such gas and carrying them in return for insurance premiums. This is much more preferable than simply shifting the ‘moral hazard’ risk of deferred ‘fracking’ problems future taxpayers. Hydrogen pipelines exist around the world. Australia’s 2005 National Hydrogen Study outlined a path to a hydrogen future for Australia that involved building an extensive national hydrogen pipeline distribution network. To gain a glimpse of the potential, Japanese researchers recently began testing a process yielding hydrogen from sewage. In Western Canada, existing natural gas pipelines in British Columbia already carry mixtures of natural gas and biofuels. Western Australian researchers have found a number of sites in Western Australia that are ideal for production of biofuel from algae. These biofuels could be carried to market through a pipeline system. They couldn’t be carried to market through LNG. Given that the US military is engaged in heavy research and development spending on biofuels at a time when US Marines are stationed in Australia’s Northern Territory, this presents ideal opportunity for Australia and America’s Pentagon to team up on biofuel research in Australia’s Top End. In the Australian northwest energy town of Karratha, a major algal-biofuel project is underway, testing the scientific economics of large-scale algae production using the region’s strong sunlight. Meanwhile Australia’s Northern Territory has been suggested as an ideal location to grow woody biomass. With the US military deploying troops in norther, Australia, the US Navy could bring research expertise to such an effort. Indonesia also holds large potential. So does Malaysia, Thailand and China. All will need a pathway to market for biofuels pipelines could provide. In 2009, Santos proposed back-hauling carbon to South Australia’s Moomba for geosequestion. In 2001, Epic Energy proposed a Darwin to Moomba pipeline to carry offshore Timor Sea Bayu Undan gas to Eastern markets through interconnections in Moomba. This offers both the prospect for Moomba to become a domestic hub for natural gas aggregation and delivery while Darwin becomes an aggregation hub for exports. A more integrated gas pipeline network would provide Australia large economies of scale. It would open up new gas fields for development and reduce the environmental footprint of the natural gas production and delivery industries. The proposals outlined above by Epic and Santos overlay nicely with the National Broadband Network and with potential intercity routes for high-capacity, long distance HVDC power lines — an idea proposed by Swiss cable manufacturer ABB. LNG doesn’t offer such adaptability or bundling possibilities. By contrast, LNG is a one-generation, single-purpose technology. In Australia, visions of a continental energy and data network are taking shape. Start with the National Broadband Network. At $40 billion, it surpasses the cost of China’s Three Gorges Dam (US$26 billion) by a significant margin. The NBN involves wiring Australia with fiber optic, including high-capacity inter-city trunks. Maps of the NBN show the following topology. Meanwhile, electricity transmission technology vendors such as ABB of Switzerland have suggested Australia more deeply link together its unconnected regional grids. These ABB and NBN visions, when coupled with Santos’ vision of a more deeply interconnected national pipeline system, naturally complement each other. To cite just a few examples, Buru Energy’s proposed Great Northern Pipeline in Australia could be used as an opportunity to lay down both HVDC to expand electricity grids in the region, and also lay down fiber optics to bring better broadband communications to the region. This, in turn, would extend the reach of the National Broadband Network. Another example would be enabling Australia to be among the first countries in the world to leverage the power of bundling together electricity, natural gas and fiber optic cables. To cite just one example of the potential, solar-powered, energy-gobbling data centers could be located in Australia’s Outback with outgoing fiber optic cables enabling instantaneous delivery of data to and from Asia. This would deepen Australia’s economic ties to the region and bind it more extensively into the region’s to its north. Merging them creates a compelling vision of a multifaceted, future proof, economically-rational, technologically-flexible energy and data network that could serve Australia well for a century or more. Australian industry is calling for a new wave of economic reform, to follow those which created a previous multi-decade wave of Australian prosperity. Australian businessmen, bankers and academics now regularly decry the lack of vision in Australia’s political leadership. They repeatedly call for longer-term thinking to ensure Australia’s economic prosperity. This overstates the problem. There are bright spots. Australia has taken a global lead in two important areas: a carbon tax and the National Broadband Network. Both are fundamental to building a low-emission future economy. Australia’s government needs to build on these foundations. It would also play to the strengths of the region. That’s because China’s State Grid Corp. has world-class expertise in Ultra-High Voltage Direct Current power lines, which it has been deploying domestically to carry large amounts of electricity from west to east within China. Providing China an export opportunity for laying UHVDC cable across Asia that would then be multilaterally managed offers an attractive commercial ‘balance of power’ with the other nations of the region, since the ASEAN countries could then operate the network from headquarters in Singapore. Both routes would require a pipeline across the Timor Sea, East Timor, the Suva Sea and eastern archipelagic Indonesia to the island of Java. A land-based pipeline system would then wend its way through peninsular Malaysia and the Mekong States to southern China. There, it would interconnect with and use China’s domestic natural gas pipeline system to carry the gas to Shanghai, from which a subsea pipeline across the East China Sea would carry gas to Japan and South Korea. A sea-based system would head north from Indonesian Java, mostly somewhere about the capital, Jakarta. The pipeline would head north to Indonesia’s Natuna Island in the South China Sea. It would then most sensibly traverse Vietnam’s territorial near-shore shallow waters. There, other pipelines already exist and offshore wind farms are planned. The pipeline would then either intersect with or perhaps parallel an existing subsea pipeline connecting Hong Kong to China’s Yacheng gas field south of the island of Hainan. From there, the pipeline could either go by land to Shanghai via Hong Kong, or travel through China’s near-shore shallow waters, including the Taiwan Strait, en route to an East China Sea crossing to Japan and South Korea. Other Asian countries are either building or planning large infrastructure projects that would lie along a Pan-Asian Gas Pipeline route. The Trans-ASEAN Gas Pipeline Project (TAGP) is a plan by ASEAN’s 12 members to deepen interconnections between their domestic pipelines to expand cross-border natural gas trade. Indonesia, Malaysia and Singapore, meanwhile, are expanding their bilateral cross-border natural gas pipeline links. In Malaysia, two major natural gas pipeline plans have been lofted to carry Malaysia gas exports to North Asia. Distinct Objective Berhad which has proposed a 4,000-kilometer LNG pipeline connecting Malaysia to South Korea. PanelPoint TAOG, which has proposed the Trans-Asian Oil and Gas (TAOG) pipeline stretching from Jakarta, Indonesia to Hong Kong, China. Further north, the Tokyo Institute of Technology has proposed trans-Asian pipelines stretching from Jakarta, Indonesia to Hong Kong, China. The institute envisages Australia exporting solar-based fuels generated from its sunbaked interior to its northern Asia trading partners. China, meanwhile, China is planning to triple the length of its domestic pipeline in the five years to 2015. This expansion will include an offshore pipeline connecting Shenzen and Hong Kong, which itself is connected to the Yacheng 13-1 field by an 800-kilometer pipeline. A Pan-Asian Gas Pipeline warrants further investigation as a template upon which other Asian infrastructure such as power lines and fiber optic cables can be laid. The first step would be to tackle the territorial issues involved. Russian Gazprom’s Nordstream project has been a pioneer in this area. Gazprom negotiating access agreements with the numerous Baltic Sea littoral transit states between Russian and Germany despite legacy Cold War mistrust issues. Gazprom’s experience could provide a template for something similar in the South China Sea. One carrot here are benefits all would derive from development of new Asian energy supplies and the means to bring them to market on an ‘open-access, common-carrier’ basis. North America’s ‘open-access, common-carrier’ natural gas pipeline network has been credited for enabling the US to lead the world in development of unconventional shale gas supplies. That’s because ensured access to market reduces the risk of wildcat exploration of new gas supplies. China, Japan and South Korea have capital and infrastructure construction skills. Singapore has managerial expertise as a trade hub that’s ideally-suited to providing the managerial sophistication to ensure the smooth running of a Pan-Asian Gas Pipeline. Indonesia, ASEAN’s largest economy and a country without a territorial claim in the South China Sea, could serve as an ‘honest broker’ in dispute resolution. Australia, East Timor and even Papua-New Guinea could be energy suppliers. A number of fora could host the multilateral dialogue necessary for a Pan-Asian Gas Pipeline. The ‘ASEAN+’ groupings may represent the most ideal fora for discussing the multilateral challenges involved in a Pan-Asian Gas Pipeline. The ASEAN states are the most advanced in the world in developing the topology and multilateral commitments necessary to enable deeper multilateral natural gas market integration through the Trans-ASEAN Gas Pipeline project. ASEAN lies in the geographic center of Asia. This makes it a natural leader in this respect. ASEAN represents Asia’s smaller economies. That gives ASEAN potential credibility as an honest broker without the singular, overriding national objectives of large economies such as China, Japan, South Korea or Australia. As a result, ASEAN could play a constructive mediator/facilitator role in Asia comparable to the role tiny Luxembourg plays in the European Union. Luxembourg is sandwiched between France and Germany, the EU’s two heavy hitters; ASEAN lies between energy-exporter Australia and energy importers China, Japan and South Korea. ASEAN already is engaged in reaching out to countries on its periphery to discuss Pan-Asian issues under the ASEAN+ groupings. In addition, China has offered ASEAN US$ 474 million to establish a maritime cooperation effort. This represents an excellent start to build upon. The Energy Charter Treaty (ECT) began as a means of providing greater investment certainty for energy project developers in the formerly communist countries of eastern Europe following the 1989 tearing down of the Berlin Wall. The ECT is now branching out and repositioning itself as a forum for negotiating larger energy issues involving multiple states. Australia, Russia and Japan are signatories to the Energy Charter Treaty. China and Indonesia are observers. That just leaves South Korea and the other ASEAN states to join to create an Asian bloc governed by universally recognised rules. APEC has the advantage of including the United States. It would provide the US and China a forum to engage in developing cooperative bilateral security for a Pan-Asian Energy Infrastructure that included region-spanning natural gas pipelines. The benefits of multilateral cooperation would be huge. One of these could be greater military cooperation between the US and China, focused on providing energy supply security to critical supply lines in Asia. This in everyone’s interest. One bold idea could involve stationing US troops on China’s Hainan Island alongside Chinese troops. Meanwhile, Chinese troops could be stationed in Australia’s Northern Territory alongside US and Australian troops. Chinese and ASEAN troops could be stationed on Indonesia’s Natuna Island in the South China Sea. Rattled by China’s extensive claims to South China Sea water, Southeast Asian nations have been building up their defence capabilities, enabling them to contribute robustly to such an international effort. This would increase communication, cooperation and provision of multilateral security to critical regional infrastructure. It would allow the US, China and the other Asian states (Australia, Japan, South Korea and the ASEAN nations) to cooperate in creating more efficient and secure regional energy trade. That’s because it can be argued that a root cause of territorial tension in the region is the increasing focus on energy resources and their safe transit to markets. Turning this source of tension into a focus of cooperation would significantly reduce tensions. And in addition to monitoring security for the pipeline, the troops also could monitor illegal fishing, control movement of refugees and combat terrorism. The benefits for all would be plain. China would gain through reducing geopolitical tension with its neighbors in the South China Sea. It would enable Chinese companies to develop offshore oil and gas supplies, perhaps through multilaterally-managed and accepted competitive auction of exploration and production rights under lease arrangements which don’t confer ultimate ownership. The United States would gain because it has stated its core interests lie in ensuring safe oceanic trade and not in the underlying territorial issues. The ASEAN states, meanwhile, would gain a seat at the table with the world’s two megapowers. This would allow ASEAN to play a valuable arbitration role. Based upon comparables, a hypothetical 67-billion cubic meter per year capacity natural gas pipeline stretching from Australia to China and onward to Japan and South Korea would cost $186-$220 billion. Assuming the system is built out over 40 years and that Asia’s energy-related carbon emissions held steady at their 2009 level of 11.4 billion tonnes, the annual investment costs of the system could be funded entirely through a small regional levy on carbon. At present, the world economy pays an estimated $500 billion a year in fossil fuel subsidies. Given that ‘Asia’ represents one-fifth of the global economy, Asia’s arithmetic share is roughly $100 billion per year, almost enough to pay the costs of such infrastructure each year. Money to enable Asia’s poorer countries to help fund their share could come from multilateral organizations such as the Asian Development Bank. For its part, the ADB has been keen to fund sensible clean energy projects in the view that such investments may largely pay for themselves through the additional economic growth and trade they would generate. The natural gas industry is hobbled by market rigidities. In Australia, the domestic pipeline network is fragmented. Internationally, many natural gas trade contracts are still indexed to oil prices, distorting price signals and obscuring the true market dynamics of the natural gas industry. Major natural gas importer Japan has added its voice to those calling for price reform in the internationally-traded natural gas sector. This has increased uncertainty in the LNG industry, particularly since officials from Japan’s Institute of International Economics have said such reforms would involve alterations to existing and future contracts. Asia is rapidly emerging as ‘the’ major player on the world stage. In coming years, Asia’s economic and geopolitical heft will grow. To assume this role, the region needs infrastructure. Integrated infrastructure can reinforce economic ties. It can provide associated benefits: enhancing economic growth, reducing poverty, battling destructive climate change and increasing marketplace efficiency. This includes building infrastructure, both hard (pipelines, HVDC, fiber optics) and soft (intergovernmental relations, military cooperation, more deeply interconnected markets). A Pan-Asian Gas Pipeline and the larger concept of a Pan-Asian Energy Infrastructure serves this goal.